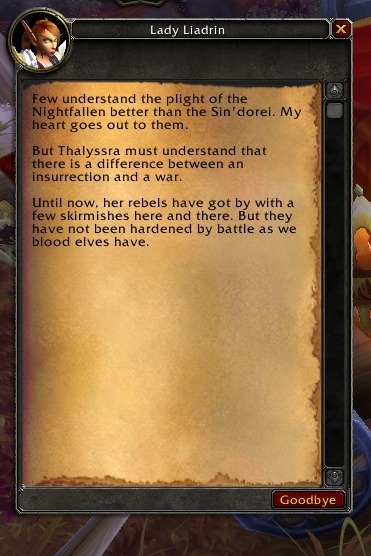 1 They aren't night elves, are they? They aren't night elves, are they? User:Springer06 Night elf means nocturnal elf as well as the alliance faction group. Not all night elves are part of the night elves, but they are all connected to and part of the Kal'dorei whole/essence in one variation or the other. We use to think this was only the alliance group, but since then we've come to know others like the Shen'drelar, the Nightborne and the Court of Farondis - all night elves too, but not that "the night elf" group. 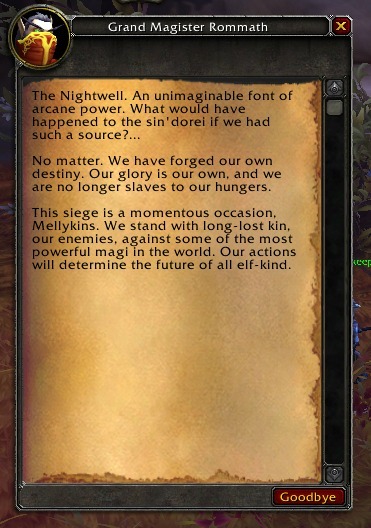 Let me offer some clarity about the sense I was using the term in: They are night elves as in race but not as in faction. They are not the night elves (alliance faction/group) but they are nocturnal (night) elves, still in the traditions, customs of night elven civilization (pre-sundering culture) just not the alliance night elven vein (post-vigil) both are equally night elven. They are just a new race of night elves, like an alternative night elf called nightborne. They didn't stop being night elves (Race) just got a new body becoming a new race (physically) but still a form of night elf. Blizzard does this all the time, creates alternative groups that are physically altered from their original group when they do new expansions, sometimes a race gets an origin variant, sometimes an evolution variant. Until cataclysm and the Shen'drelar, we assumed night elves were only one group both race and faction, but since then we are alerted to other types of night elves, these include the Shen'drelar from Eldre'thalas, the Nightborne of Suramar and the Court of Farondis of Nar'thalas - they are all night elves too, just not part of the faction night elves and have different characteristics. Blizzard may choose to make them a playable race in their own right, or sub-race of night elves if they do sub-races. Up to them. Remember that Worgen and Forsaken are technically sub-races of human yet they are developed as their own race. In many ways blood elves are a sub-race of night elves (lore wise) even though high elves came first in WC2, but are developed as a separate race, this can happen. It won't stop Nightborne from being night elves as they don't come more night elven (nocturnal, night elf empire) than them, having every right to the name as the alliance faction "the night elves" or the Court of Farondis (unliving night elves). This page was last edited on 20 December 2017, at 23:21.